It has been a while since I read an historical romance novel. But then I read the blurb for this book and decided to make a short trip back to the land of historicals. 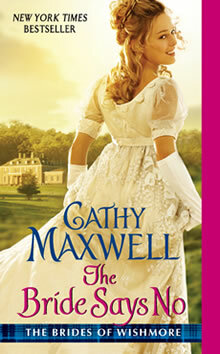 I am really glad I did with Cathy Maxwell’s The Bride Says No, because this story was different. The Bride Says No was a great surprise for me, because it is completely different from all the historical novels that I’ve read in last ten years. The author stepped out from the established forms of historical romance novels and wrote something completely new. Ms. Maxwell’s story did not focus on just one couple and their path to the HEA. She incorporated and told three interconnected romances in this relatively short story. The writing is good, the author kept control of the reins to the story the whole time, and I liked the way she decided to give voice to each character. The tale it is told from the different perspectives, providing the reader with the thoughts and feelings of each character when it is important. The downside of interlacing three stories within the main love story between Lady Aileen and Blake was that it was a bit rushed. But on the other hand, it is quite obvious that Lady Aileen and Blake are not the main characters and that the overall story arc in this and in future books in the series, “Brides of Wishmore“, is and will be, Lady Tara. Ah, Lady Tara, she is such an interesting anti-hero; the one I love to hate. In the end I cheered for her. The author also tackled some very interesting issues in this story, such as a status of women in the Regency era, hypocrisy of the society and domestic violence. I found that these topics are gently introduced into it and they do not burden the story, and on the contrary they enrich and uplift it in a way that The Bride Says No became more than just story about affairs of the heart between male and female characters. As I already mentioned, The Bride Says No is the first book in the series “Brides of Wishmore“, and I would really, really love to read the second one – a Lady Tara story, because I have a feeling that it will be something like Shakespeare’s The Taming of the Shrew ( one of my favorites of his comedies). Finally, The Bride Says No is just a great story and well worth a reader’s time.